Next, travel to Capernaum, the center of Jesus' ministry. Visit the synagogue on the site where Jesus taught (Matt. 4). The Orthodox church is built in the middle of the ruins of the ancient Roman village of Kfar-Nahum (Capernaum). Around the church the remains of the village have not yet been excavated, unlike the synagogue of Capernaum and the buildings around it. The area under the control of the Orthodox church is 1/3 of the entire ruins, which covers about 60 dunams (6 Hectares). The village was established in the Hellenistic period, and was designed according to that period's urban design of straight lines. The village prospered in the Roman and Byzantine periods. It was destroyed in the Persian conquest in the 6th C AD. Capernaum is located on the northern shore of the Sea of Galilee. 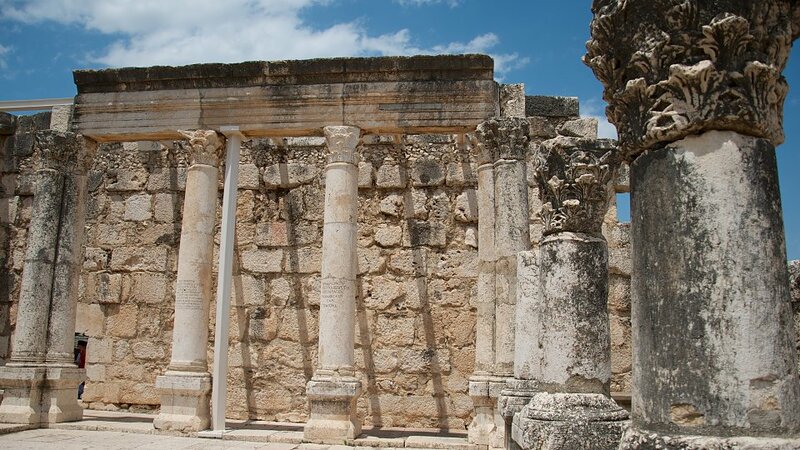 Jesus adopted Capernaum as his hometown and headquarters for his ministry. In his time, it was a border town with a customs station where taxes were collected. Peter lived in Capernaum and Jesus called Andrew, James, John and Matthew to join him. Jesus performed many miracles in the town. Capernaum was the center of Christ's ministry and the place where he called several of His disciples to Him. Capernaum is a compelling location to consider the calling of and to Christ. As the good shepherd, Christ calls His by name and they are willing to come unto Him as we see in the calling of the apostles.